In 2017, India’s solar thermal market shifted heavily in favour of flat plate collectors, with systems based on concentrating technologies losing ground. 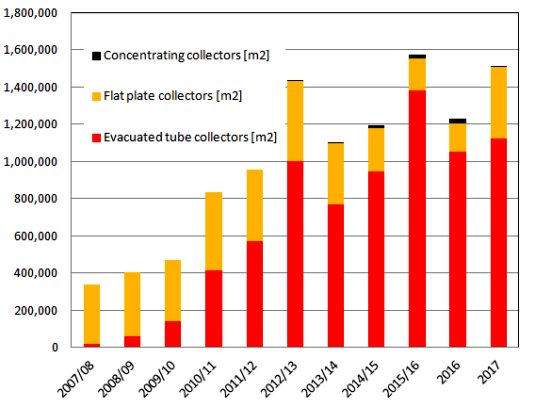 The chart shows the annually installed flat plate collector area to have more than doubled last year compared to 2016. It went from 150,476 m² (105 MWth) to 397,286 m² (278 MWth) an increase by 164 %. Installation figures for solar water heaters based on imported vacuum tubes rose by 7 % to 1,120,963 m² (785 MWth). Concentrating collector sales, on the other hand, only added 5,450 m² to the total, a much lower value than the 26,040 m² in 2016. The reference period for the annual statistics was changed in 2016. It is now the calendar year, whereas it used to be the Indian financial year, which runs from 1 April to 31 March the following year. The market data for 2017 has been supplied by Indian consultant Jaideep Malaviya, who based his analysis on the statistics available about vacuum tube imports and on a survey among the few flat plate collector manufacturers still operating in the country. According to data from authorised agencies, India imported 4,594,112 vacuum tubes under five HS codes between January and December 2017 (see the following table). The most common type of imported tube measured 58 mm by 1800 mm and had an average absorber area of 0.244 m², bringing the total to around 1.12 million m². The share of completely imported solar water heaters increased significantly in the last years to close to 15 % in 2017. In the 2016 calendar year, imports had registered a bit below 4,300,000 tubes, or a total tube absorber area of around 1 million m² when multiplied by the standard factor. Vacuum tubes combined with aluminium mirrors, called compound parabolic concentrators or CPCs, continue to be the solar heat systems of choice for industrial customers. But the fact that they were no longer counted separately based on the HS codes created some difficulties in deciphering the 2017 statistics. The newly installed flat plate collector area has grown substantially and has reached nearly 0.4 million m². India’s manufacturers have explained the growth numbers by pointing out that several states had started to invite tenders requiring a certificate from the Bureau of Indian Standards. At present, this certificate is only available for flat plate collectors. Another factor has been the ongoing discussion about the sub-standard quality of certain imported vacuum tubes. This debate has likewise tipped the scales slightly in favour of flat plate collectors, especially in projects which require quality work and long-term reliability. The concentrating collector market experienced a significant drop in 2017, adding only 5,643 m² last year, according to statistics provided by the MNRE, India’s Ministry of New and Renewable Energy. The reason for the downturn was the end of the UNDP-GEF programme, which had offered an additional 15 % in the form of grants at the end of 2016. The confusion surrounding the MNRE’s 30 % capital subsidy for concentrating collector systems has also slowed down the sales activities of technology suppliers. The MNRE approved last year’s applications only on a case-by-case basis. It has not yet announced a revised subsidy scheme, but will do so any time soon, according to Malaviya.